Cottage in a Day | A Continuous Lean. There was a show on HGTV a while back about people that preferred small spaces over massive homes. It is something that has really resonated with me over the years. A few months ago I posted something about Tiny portable homes that people seemed to like. Well, apparently the folks in Traverse City, Michigan (that’s the pinky of the mitten for those of you that aren’t great with middle-west geography) also know a thing or two about small spaces. Materialicious turned me onto a company called Cottage in a Day, who worked with architect Michael Fitzhugh to design a group of fantastic looking modular cottage homes. According to the company, once all the components arrive, setup can be done in a few hours. Hence the name Cottage in a Day. I would love to get a nice piece of Sullivan County (New York) and plant one of these great looking homes. More images after the jump. “Small Space, Big Style” is still on HGTV, actually. Unfortunately, it’s on at 9 am on Wednesdays, so I DVR it every week. I am going to put one on a lot in Fishtown, USA. Seth â€” thanks for the tip. I usually watch CHiPs at 9am on Wednesdays, but will DVR it now and watch HGTV. Nick â€” I think CiaD has an armor plated version. ha! Dwell magazine is also a great resource for modern modular homes and such. Great, now I will have the CHiPs theme song in my head all day…and probably flip my Pinto over the back of a school bus. My fiancee liked to read the magazine Cottage Living. I even bought her a subscription. Unfortunately they went under like so many others, so now we get This Old House…it’s just not the same. 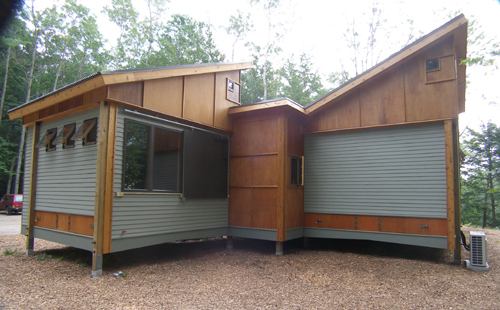 They really use hardware well on these – sliding shutters, and those latched storage spaces. I think it would be interesting to create a development of houses like this on big abandoned city lots – true urban homesteading.